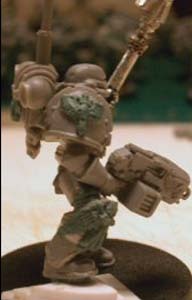 To start off, the model's legs were completely repositioned combined with a few plastic card insertions to make the model taller (a very easy way to make your marines look larger, there are many more realistic yet more complicated methods out there). 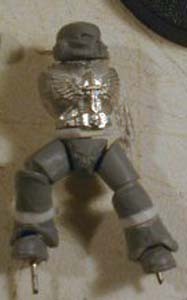 The pose has to present the non-charging but leading idea. 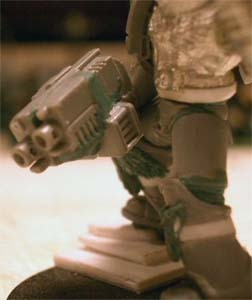 The Storm Bolter looks a bit "weird" you might think, but I wanted a unique look, its made from a regular bolter combined with the Vehicle Accessory sprue-Storm Bolter. The Crozius Arcanum is actually made from two separate Crozius Arcana, one from a "regular" Chaplain and a piece from Asmodai's. 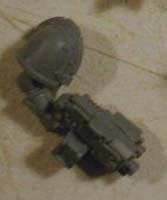 Other parts include the legs from a plastic Chaos Marine, arms, head and a Ravenwing Torso. 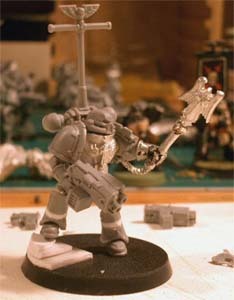 I started this project when I was reading a lot about and seeing a lot of pictures of Enlarged / True-Scale Marines. 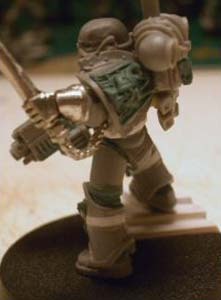 This project (still going on) was a new motivation drive for me to get more involved with the Dark Angels again and involves an entire true-scale Marine force. 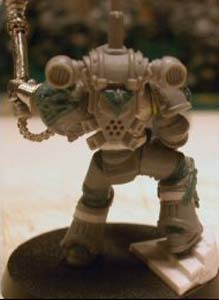 Starting a whole new army would allow me to more or less dump my old army, or at least not have to look at all my first-ever paintjobs for awhile. Basically a lot of thought went into this project including some ideas for fluff to back up army composition etc. (this includes a squad of "Knights of the Order"). 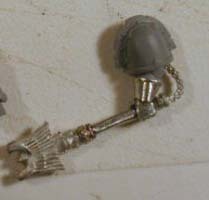 It is a Dark Angels army and therefore of course has to include certain real Dark Angelique choices, units that are unique to the Dark Angels. The very first one that comes to mind here is off course the Interrogator-Chaplain. There are a few characteristics that I wanted to include. First off all he had to be true-scale, he had to "look" like a Dark Angel and with some of the fluff idea's I made for him I wanted him to look a bit old & wise therefore not charging into the combat himself but rather give the idea as if he was commanding the troops around him. 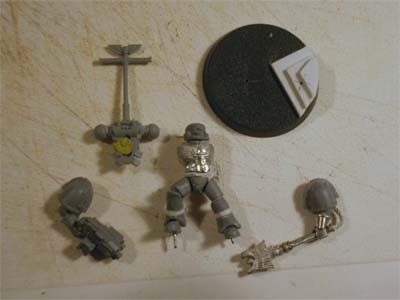 These characteristics were also a motivation for the wargear and armoury choices, a Storm Bolter & Bionics to present WYSIWYG rules, and also a few other pieces that CAN represent certain pieces of wargear. Some green-stuff basically filled the holes (ribbing) and added some icons. As with all Green-Stuffing, practise and patience are the two most important words, that said I will admit right here that at this point all the icons are casts. 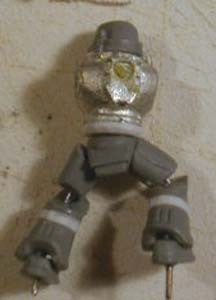 (Later you will/might see them change a bit, as I will be changing/adding some parts... for the better or worse).